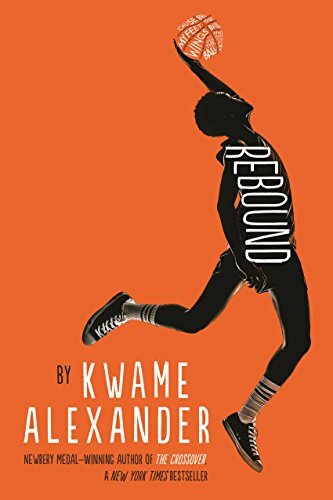 Kwame Alexander won the Newbery Medal for his previous verse novel The Crossover, published in the U.K. 2015, also by Andersen. This is a worthy successor. Once more, basketball is a preoccupation. The title, like that of its predecessor, refers to a move in the game. It also has another meaning, of course. Charlie Bell’s father has died suddenly from a heart attack and, even more shockingly, right in front of twelve year old Charlie. You don’t rebound from that easily. And Charlie feels helpless and angry. He is withdrawn and insecure, arguing with his mom and, for the first time, skipping school. Yet we know, from the very first page, that there is more to Charlie than the pain which has knocked him off his feet like an unexpected move from an opponent; and a lot more than his constant desire for more fashionable trainers. We know this partly through the care of his friends and his regard for them, but also through his own passion for the game, and for life, driven underground but still flowing strongly. We see it in the solitary comfort he finds in superhero comics and his daydreams of dazzling feats on the basketball court, shown in vivid occasional comic strip by Dawud Anyabwile. But most of all we see it in Charlie’s love of language, the verve and drama with which he describes the world. We know this almost from the very first page when his virtuoso account of a street basketball game ends with his downbeat refusal to take part. But there’s a lot to go through before he bounces back. His mom, who can no longer cope with him and her own grief, sends him to spend the summer with his paternal grandparents. Gradually, under their loving discipline and the basketball tuition of his cousin Roxie, he starts to embrace life again, and to become Chuck rather than Charlie. But not before there is a dreadful misjudgement that might knock him back once and for all. The novel is a paean of praise to the redeeming power of family and friendship. It’s a tribute, too, to African America. Not only to the African American contribution to basketball – it’s no mistake that the Harlem Globetrotters feature – but that love of the play of language which, like rap itself, derives from the spoken word. It’s a novel that’s both moving and exhilarating, even for those who have no love of basketball.